You have heard the saying, “you are what you eat.” That is not entirely true. 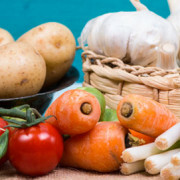 You are not just what you eat, but what (nutrients) you absorb. And just because you take deep breaths does not mean the oxygen is actually getting to your tissues! When our bodies are oxygen deprived there is a greater chance of muscles weakness/pain, “fogginess” or poor mental focus, sluggish digestion, insomnia, and even frequent sickness/infections. If you want to read more on the breathing subject, check out “The Oxygen Advantage” by Patrick McKeown. Here are a few quick and easy breathing tips that will enhance your health! The straighter your spine the less compression on the lungs and more access to your diaphragm. Speaking of the diaphragm, it is the dome-shaped muscle just below the heart and lungs and is the primary muscle for breathing. Most of us are shallow breathers, meaning we only breath into our chest area. 2. Breath through your nose. Your mouth was meant for eating, and your nose was meant for breathing. There are many benefits to nasal breathing but I am just going to mention two. Nasal breathing improves your body’s ability to utilize oxygen. As I mentioned above, the oxygen will have a better chance of getting to all of your muscles. Nasal breathing also stimulates our parasympathetic nervous system – rest, relax and digest part of our nervous system. Place your one hand on your chest and one hand on your belly. While inhaling through your nose, allow ONLY your belly-hand to rise. Follow that with a natural exhale through your nose. Continue for about 30-seconds or more. *Bonus, you may even feel your back expand. If you are laying down then feel your back body (upper and lower ribs) press into the floor on your inhalations. If you are sitting up then feel your back body expand into your clothing. All parts of our body function better with more oxygen! Learn to breathe with your diaphragm. Shut your mouth… AKA practice nasal breathing. To calm your mind and your body, exhale slightly longer than you inhale. Shoot for 5-6 breaths per minute. Inhale 4, hold 2, exhale 6. If that is too challenging at first, start with inhale 3, hold 2, exhale 4.
https://sweatplaylive.com/wp-content/uploads/2019/03/E666AE3B-723D-4775-B3ED-507AF559130B-e1551993169745.jpeg 333 500 admin https://sweatplaylive.com//wp-content/uploads/2017/12/logo.tm_-1.gif admin2019-03-07 21:13:432019-03-07 21:13:43Quick Breathing Tips for Enhanced Health! 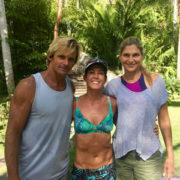 Laird Hamilton, Gabby Reece and Brian Mackenzie are legends in the extreme sport biz. They recently combined forces and created XPTlife, a complete fitness-lifestyle program that includes bodyweight, gym and water workouts, combined with breathing and active recovery methods. By the way, XPT stands for Extreme Performance Training and these three walk their talk. Laird is most known for surfing giant waves (think 50 to 100 foot monsters), but is also an innovator of many board sports – if you have ever been on a Stand Up Paddleboard (SUP) you can thank Laird for that. His wife Gabby is a former professional beach volleyball player and an incredible role model for healthy living. Brian is the head program director for XPT and a world-renowned strength and conditioning coach. Last week I had the the pleasure of helping out Laird, Gabby and Brian, and the entire XPTlife team during their inaugural XPT Experience Retreat here in Punta Mita, Mexico! Three days immersed in outdoor fitness, and body and mind wellness techniques – You can bet that I was a kid in a candy store. 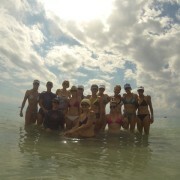 I soaked up every moment and have already incorporated some of their training principles into my routine. 1. Change is the only constant – The XPT Experience days are full. No moment is the same as the last. You begin with breathing, then pool workouts, strength class, ice plunge, hot saunas, and my beach bootcamp thrown in just for fun! When I began my fitness career, I taught 12 Taebo classes a week for 2 years straight. Every kick, every punch. I did not know how to talk and teach, I could only show (talk) and teach. My body broke and at 24 was over-trained and had constant sciatic nerve shocks running down both legs, chronic back pain, and insomnia. Not awesome. It wasn’t until I started strength training, mountain biking and trail running that I actually began to feel stronger in my body. Today, I am always throwing “out of the box” drills at my students and encouraging my clients to keep mixing up their movements and their workouts. You do not necessarily need to jump in an ice bath (although you may like it – see #2), but try using your less dominant hand to unload the groceries or brush your teeth! Just constantly mix it up! 2. Shock your system – Our society is conditioned for comfort. We get hot and we put on the AC. Two hours post-lunch and we are hangry for a snack. I joke that the reason my husband moved us down to Mexico was so he wouldn’t have to listen to me complain about how ‘cold’ I was all the time. Guest speaker, Dr. Andy Galpin explained that because we are always seeking (and finding) comfort our bodies have actually lost the ability to adapt. You know those people who obesessively shun carbs and now get sick after eating one chip? That is what he is talking about. XPT’s way of shocking the system is the infamous ice bath followed by the not-so-infamous hot sauna. There are physiological benefits to thermal contrast therapy such as blood and lymph circulation, but what we actually got to experience was overcoming something really, really, really uncomfortable. period. During my stage-racing days I had some painful and desperate moments (imagine 10+ hours on a bike saddle) but three minutes being a human slushy was infinitely harder. But I did survive. 4. Narrow your focus – So what do you do when you are swimming across a pool with weights while holding your breath? You find calm anywhere you can. Playing in the water holding dumbbells can be very scary for some. The uncertainty causes your breath and heart rate to speed up, and as a result you feel stressed. Gabby’s tip was to ‘narrow your focus’ – literally squint your eyes, because even the energy of looking around uses up valuable oxygen. Seriously. I like this tip and think this can be applied to our day to day life. If you have too many thoughts running around in your head and start to feel a little stressed, just narrow your focus. Pick one thing, knock it out and move on. Calm will follow. 5. Be your own guru – Gabby, Laird, and Brian are constantly researching and learning from the best in the business and openly share what they know. Each incorporates optimal wellness practices into their lives but are flexible and do not obsess about it (amen). They are continually evolving and admit that what they might be teaching in five years may be totally different than today. They also stressed that not every technique is going to work for every person. My advice? Instead of trying your BBF’s new diet or following your gym’s cookie cutter program, try waking up every day and tuning into how you FEEL. What does your body need today in terms of nutrition, movement and rest? Use your intuition. Wellness is not set in stone. Experiment with what makes you feel good, strong, energetic. Be your own guru. The experience ultimately validated my own training/life principles and gave me more confidence in practices I always hope to inspire in others: Be open to learning new concepts, mix it up, get outdoors and play outside your comfort zone. Laird told us a saying that they have in Hawaii, “It’s not who you are, but how are you.” I can tell you that besides being uber athletes, these three are kind, passionate and the real deal. If you get a chance to attend one of their workshops or one of their XPTlife Experiences, you will not be disappointed! https://sweatplaylive.com/wp-content/uploads/2017/05/gabby-laird.jpg 300 400 Shanti Tilling https://sweatplaylive.com//wp-content/uploads/2017/12/logo.tm_-1.gif Shanti Tilling2017-05-15 15:57:472017-05-15 19:15:15Be Your Own Guru: What I learned from spending 3 days with Laird Hamilton, Gabby Reece, and Brian Mackenzie.